So you’ve decided to take a camping holiday and need a tent or perhaps your old tent is ready for an upgrade? If you don’t want just any old run of the mill tent, check out these cool tents for inspiration instead. While just a bit unrealistic (what, you don’t need a wood-burning stove and a sink in your tent? ), they are lots of fun and might spark some ideas about what you’d like to see in your next tent. While there are lots of wacky tents out there, these 10 struck us as some of the coolest camping gear on the market. This cool tent from Field Candy sleeps two people and would be perfect for someone who loves to read. The outer flysheet features the fun book design that makes it look like you’re taking shelter under a huge book, but the interior keeps condensation to a minimum and has a breathable skin so you won’t get hot. It also features a mesh window, storage pockets (that even lock!) and a place to hang a lantern. Featuring a base length of 2.56 metres, a width of 1.86 metres and a height of 1.20 metres, this tent should allow you and your mate or significant other to sleep comfortably. Going on a camping trip with your mates or family? Create a private tent village with these tee-pee style tents and tunnel system from Gigwam. Each tent sleeps two people and has an attachable tunnel that can be connected to another Gigwam tent, allowing you to create a little cool tent town of your own. It’s almost like revisiting your childhood to crawl through a tunnel to get your friends. Sound like fun? We agree. Camping will become very comfortable in one of these Tree Tents. The round structure of this “tent” allows for accommodation of two adults easily and features a green ash wood frame with an aluminium subframe that is covered in a 100% cotton canvas. However, and this is where it gets good, there are options to add a wood stove, water and solar power for electricity as well as 100% thermal wool liners for comfort in any temperature. Plus, the furniture for the “tent” includes chairs that convert into beds, a sink and a centre table. This inflatable tent from German company Heimplanet sleeps two to three people and takes about a minute to set up – simply grab an air pump and get going. The “Cave” tent is shaped like a dome with an inflatable frame and fly sheet surrounding the actual tent. The frame was designed in such a way that there are stabilization measures in place in case of an air leak in one of the chambers on the frame. Another feature of the tent is that, while included in the tent package, you don’t need guy lines because the tent is stable even up to 120 km per hour winds. It’s a jacket; no, it’s a sleeping bag; no, it’s a tent! This all-in-one camping set from U.S.-based JakPak is not only a waterproof jacket but can become a sleeping bag and a tent. Both parts are carried in bags located on the back of the jacket. The sleeping bag portion is located in the lower pocket and falls down from the back of the jacket. Once you step into it, you simply zip up, and you’re set. The tent part is located in the upper pocket that once you pull out, you just lay down and pull over you. Everything is waterproof, and there is also netting included in the tent portion that deters even the smallest bugs while still allowing you visibility. Most people who own motorcycles take extra measures to make sure they stay in tip top shape. Well, this tent has those motorheads in mind because it comes complete with a place to park your bike and keep it dry and away from the elements. The sleeping area has plenty of room, enough to even put up cots if that’s your style of camping. A simple three-pole design makes it easy to set up and take down the tent, and the tent is lightweight and packs down to only 53 x 22 cms, so if you happen to pack everything on that motorcycle it shouldn’t take up too much room. The tent features two optional different ground sheets – one for the sleeping area and another for the “garage” (keeping condensation away and entrances clean). This tent is designed withstand even the most extreme temperatures. Actually, it’s more than a tent really, it’s a dome that shelters up to 10 people. The double-wall design keeps the elements out as do the perimeter snow flaps (not that you’d have to worry about that on a Byron Bay holiday!). Even though there are a lot of poles crisscrossing the tent, set up is made simple through the color-coded webbing at stake out points as well as the reflective colour coded starter tab on the rainfly and canopy to help in pitching the tent. It probably weighs the most of all these tents at 20 kg, but then again it holds up t0 10 people so that’s a lot of tent! While still in the theory stage, you can head over to Kickstarter and get in on the concept of this super cool tent. The one-person quarters features not only a built-in sleeping bag but also an insulated mattress and, best of all, it can either be used as a traditional tent or hung up like a hammock so you’re off the ground (it can hold up to 130 kg when used as a hammock). Other excellent features of the tent include a super-waterproof rip-stop nylon keeps the tent and anyone in it dry, a bug-proof mesh and two ventilation outlets to keep condensation at bay. Plus, it only weighs 3 kg, and it hooks up to other Hybrid tents. All in all, we hopes this tent moves from theory to production! This roomy tent not only is a great way for you and three of your mates to camp, but the exterior design will totally fit into Byron Bay vibe. The VW Camper Van Tent is officially licensed through Volkswagen and is a full-size replica of the iconic 1965 Volkswagen Camper Van. Since the tent zippers off into two rooms and an adult can stand up inside the tent, you could easily come with your partner and bring another couple. The tent comes in either red or blue. For the final tent of this round up of cool tents, we bring you the Lotus Belle tents, which might be where the term “glamping” originated. These tents are large enough to fit either a king or queen bed (see featured photo for the post and one above) and still have room to move around! The tents feature many of the usual modern camping requirements, such as a velcro groundsheet to keep off the actual ground, larger roof for additional ventilation and exterior canvas to keep rain out. But really, all you need to do is check out the pictures, and you’ll see why we included these tents. Bring your cray cray – or completely normal – tent and camp at Broken Head! 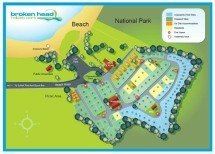 Even if you don’t have a cool tent, you can still have a blast planning your next camping trip at Broken Head Holiday Park. With powered and unpowered campsites available, Broken Head offers large, well-maintained sites for your tents, with only a $5 per day difference between the two types of sites. Proximity to Byron Bay and quiet, beachfront surroundings makes Broken Head the perfect location for your next camping holiday.